Today in History–May 28–the Library of Congress features the Woman’s Rights Convention, held in Akron, Ohio on this date and May 29 in 1851. Convention topics included common law, education and labor, including wage inequities. 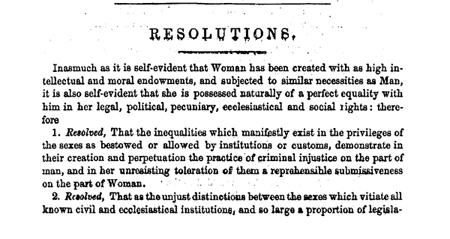 Find out more about the early efforts of women’s rights advocates by visiting the Today in History section, then click the links below to access primary sources related to the 1851 convention and those that preceded and followed.